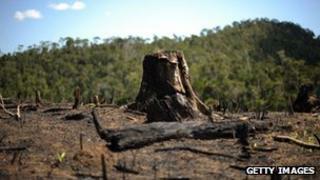 A majority of Madagascar's palms face extinction due to land clearing, an environment protection group says. The group called the figures "terrifying", saying the tree loss also endangered animals and put people's livelihoods at risk. The IUCN's global director for biodiversity conservation, Jane Smart, said the latest study showed the situation could no longer be ignored. "The figures on Madagascar's palms are truly terrifying, especially as the loss of palms impacts both the unique biodiversity of the island and its people," she said. Madagascar is the world's fourth biggest island after Greenland, New Guinea and Borneo. Palm trees represent an integral part of the island's biodiversity, with many of its poorest communities relying on the trees to provide housing and food. "The majority of Madagascar's palms grow in the island's eastern rain forests, which have already been reduced to less than one quarter of their original size and which continue to disappear," the IUCN's Dr William Baker said. "The high extinction risk faced by Madagascar's palms reflects the decline in these forests, which threatens all of the remarkable wildlife that occurs there," Dr Baker said. The worldwide number of animals and plants on the IUCN's Red List of Threatened Species is now 65,518.